We had an immensely fulfilling time with the young women at the SRS Sarvodaya Hostel in Chennai last week, where we worked on safe and unsafe touches, the concept of consent and personal integrity and simple ways to stay safe. As an ice-breaker, we started by asking the girls to share their names and their ambitions / dreams - it was touching and inspiring to see such a band of bright, energetic and vibrant young women, nurturing ambitions and goals including such things as becoming pilots, doctors, singers, teachers, lawyers, diplomats and even police officers. Thanks to Sneha Sridhar, Varsha Balajee, Vaishnavi Pallapothu and Ms Saraswathi Anoop of the Akshar Aarbol International School for including us within the scope and ambit of Sneha Sridhar's CAS Project, which put all this together. 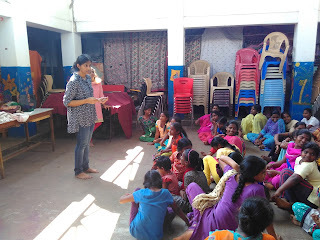 During the session, one of the girls asked us a question that made us think deeply. "Sometimes, no matter what we wear, we are groped / harassed / abused. Does this mean that we must dress conservatively?" We explained to her that NOTHING she did or chose to do did or would ever ask for abuse or harassment, and, that NOTHING she did or chose to wear did or would ever ask for abuse or harassment. We told her that she should never assume responsibility for the wrongdoing of another. 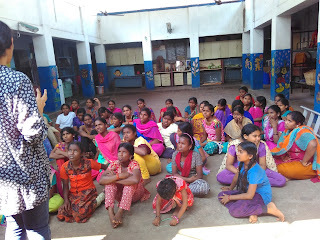 It was an insightful and profound moment for the girls to reflect upon, for being fed multiple messages that the girl is at fault for every incident of abuse she faces had taken away some element of her personal agency. Later, the girl herself, stood before the class and sang us a song - of course, out of the fact that she aspired to be a singer.